We Bring To Life America’s Best Places To Live And Play. East West Communities invites its residents to experience an extraordinary quality of life. Inspired by a foundation of achievement, experience, and creativity, East West Communities endeavors to stay on the leading edge of development, shaping superior communities with innovative, resort-style amenities. We are committed to environmental stewardship and introducing industry-leading standards to preserve nature for the enjoyment of generations to come. For four decades, the East West Communities team has worked and will continue to work together to bring to life America’s best places to live and play. 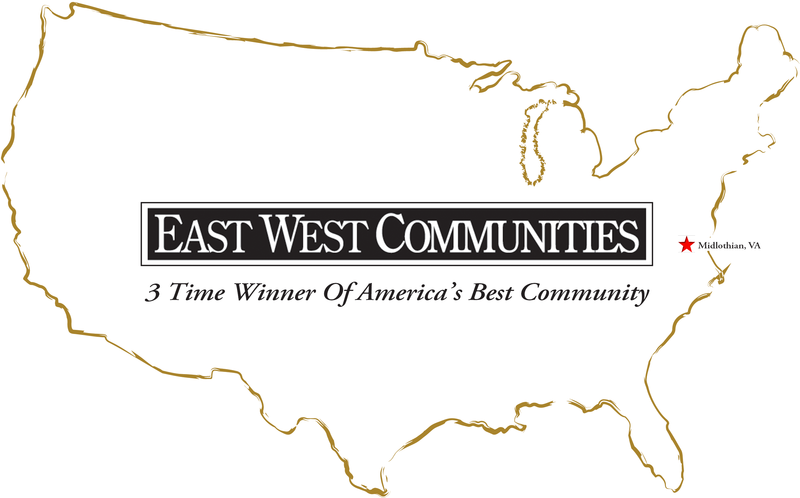 Since 1973, East West Communities has developed 25 award-winning communities that are home to more than 20,000 families. The company purchased land in Chesterfield County, near Richmond, Virginia, with unprecedented plans of building a community that would offer a vacation lifestyle for everyday living. The first community, Brandermill, became home to 4,400 families and was named the “Best Planned Community in America” in 1977 by Better Homes and Gardens Magazine and the National Association of Homebuilders. The second community, Woodlake, also near Richmond, was chosen “Best Community in America” by the 14,000 members of Urban Land Institute in 1990. And now, Hallsley, one of the most recent additions to East West Communities, was the chosen the national platinum award winner for the 2017 Best Master Planned Community by the National Association of Home Builders Best In American Living (BALA). Hallsley will be home to 800 families at completion.